Rita Singh from Ghaziabad, B.Sc Graduate. ADOBE PHOTOSHOP ADOBE CORELDRAW ADOBE ACROBAT ADOBE INDESIGN ADOBE ILLUSTARTOR WRITE CONTENT WRITES BLOGS WRITER TECHNICAL WRI..
are one of expert skill area's of Rita Singh . 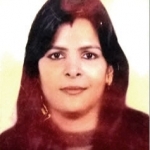 Rita Singh is working in IT Software industry.